Wood burning or multifuel stove? A stove fitter decides. Most people who buy a multifuel stove only ever burn wood. My advice is that you go for "wood only". Why? Read on to find out why. “Wood only” means the stove only burns wood. Multifuel means the stove can burn wood AND coal/smokeless fuel. A multifuel kit can be added (although this will usually reduce the space available for logs). Over 75% of people who choose multi fuel end up burning only wood. Wood-only is the trend (2015-2019) as wood is a renewable resource so better for the environment. So should you purchase a wood or a multifuel stove? Let’s first look at some terminology: Before we start: DO NOT buy any stove until you know that it will fit wherever it is that it is going to be placed (if it is to live in a recess then is the space large enough for the stove with the required air gap around?). Wood burning stove: is a term often used to cover all appliances that burn wood/smokeless fuel/coal but it means wood only. "Wood burning only" stove: means that you can only burn wood, a most environmentally sound option as wood is a renewable source of energy. Multifuel stove: means that you can burn smokeless fuel AND wood (and coal but we don’t speak too much of it because it is sooty, clogs up liners with soot, and is damaging to our environment). Solid fuel: “a cover all” term for wood, pellets, hay, smokeless fuel/coal etc. (not liquid or gas). Some “wood burning only stoves” can be converted to "multifuel". Stoves with a raised "grate" can burn wood and smokeless fuel (although this will likely reduce the space available for logs). Smokeless fuel is dense when piled and requires additional air from below. The floor of the appliance receives the grate. Wood, having plenty of air passages throughout a stack, does not need extra air from below and performs best when there is less air from below (hence if there is a grate then instructions may tell you to “build up a bed of ash” to seal any air vents). A good design of multifuel stove will have controls suitable for covering both fuel types. The advantage of “wood only” stoves is that there is a little more room for logs, plus the resulting smug feeling of being environmentally friendly ;-). Are you a wood scavenger? This activity can be great fun. Having more room for the logs is a benefit when trying to decide between a wood burning or a multifuel stove. How much wood can you get hold of is an excellent question to ask yourself? You can purchase wood of course but if not then you have to source it, store and dry it. If there are times when wood is difficult to get hold of maybe being able to add smokeless fuel is a benefit (you can always buy compressed sawdust logs which burn beautifully, better than wood actually because they are so dry). The advantage of having a stove that can burn different fuels is that you can choose your fuel. I like wood-only stoves because wood is a renewable resource. 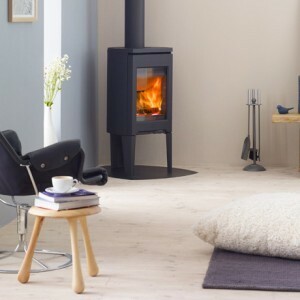 Will you choose a wood burning or a multifuel stove?